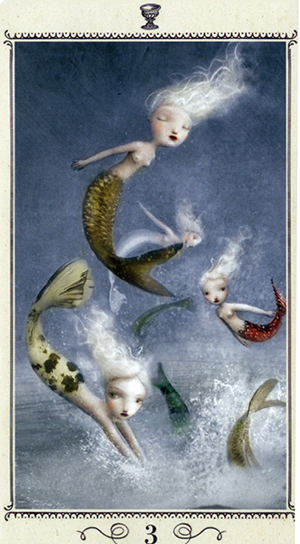 Today’s tarotscope — Three of Cups — is part of the Ceccoli Tarot series by Nicoletta Ceccoli. Nicoletta Ceccoli is a prolific and acclaimed painter whose richly detailed, dreamlike work has earned her fans all over the world. Limited edition prints of her beautiful artwork is also available for purchase through AFANYC. This is a Lo Scarebeo deck, published by Llewellyn. Please also visit and “like” the deck’s Facebook Fan page.